Description: The man pictured on the left hand side of each 1935 $1000 bill is Wilfrid Laurier. He was the seventh prime minister of Canada. He passed away 16 years before his image would be used on these bank notes. 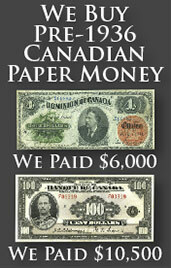 Each $1000 bill was printed by The Canadian Bank Note Company, Limited. The back shows a kneeling woman and a cherub. We are looking at the French version which references La Banque Du Canada instead of The Bank of Canada. The French version is five times rarer than the English version; although it is not five times more valuable. Each note is still valued based on its condition. Please read our guide below to learn more about how to price your bank note. We buy all French version emission de 1935 $1,000 bills from Canada. Values are based purely on condition and generally range from $3,000 to $20,000. If you would like our offer, then please send us pictures of your bank note. 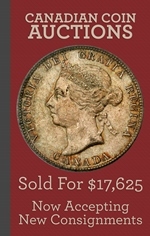 We will grade the paper money and respond back quickly with our buy and sell price. You might be surprised at how much money some high grade 1935 one thousand dollar bills are worth.